The Illinois Technology Association’s annual CityLIGHTS awards is always big event because it honors the best and brightest in Chicago’s thriving tech community. This year’s bash was especially exciting because Eric Lunt, Signal’s Chief Technology Officer, received one of the event’s top awards, being honored as Technologist of the Year. The Technologist of the Year Award is presented to the individual whose talent has championed true technology innovation, either through new applications of existing technology or the development of technology to achieve a truly unique product or service. Eric is the technology force behind Signal’s Open Data Platform, which helps marketers collect, connect and act on their cross-channel data for improved customer engagement, loyalty and conversions. Prior to Signal, Eric was co-founder and CTO of FeedBurner, which Google acquired in 2007. After the acquisition, Eric remained at Google in a senior technology role. In addition to his work at Signal, Eric is a senior technology adviser to Twitter, and was on the board at Gnip, which was acquired by Twitter in 2014. 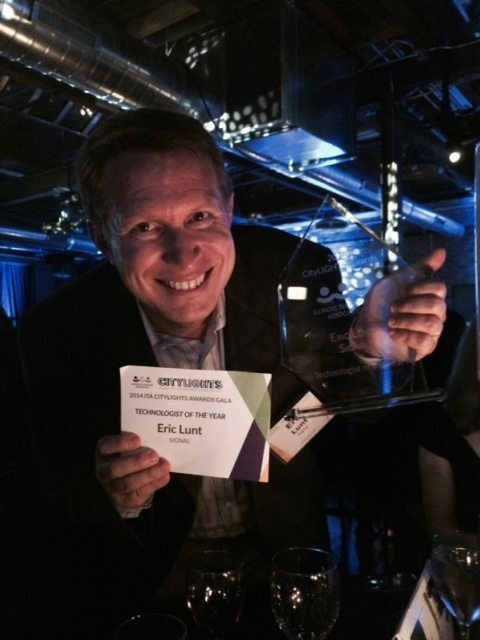 Eric was recognized in 2011 as one of Crain’s Tech 25 for his contributions to driving technology growth in Chicago. Congrats to Eric and all the winners!